After decades of bickering, federal indictments, and legal uncertainty, the first legal online casino has opened up in the state of Nevada. The site, UltimatePoker, is a subsidiary of the Station chain of brick-and-mortar casinos. It aims not just to offer 24/7 Internet gambling to interested Nevada residents, but also to prove that the concept can be run legitimately. Internet gaming, of course, is nothing new. The first online casino opened in 1994, with online poker itself enjoying a major pop culture boom in 2003-4. But online betting came to a screeching halt in 2006 when the government made it a federal crime for a company to offer online gambling in states which prohibit it. 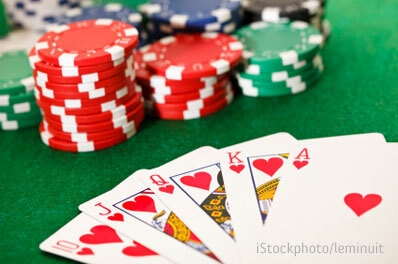 UltimatePoker gets around this law by offering its service only to Nevada residents. It’s worth noting that the UltimatePoker site only offers poker. There’s no blackjack, no roulette, and no high-limit go fish. That shouldn’t be a drag on UltimatePoker’s bottom line, though – online poker is estimated to be a multi-billion dollar industry. If Nevada’s experiment is successful, you can expect other cash-strapped states to follow suit in offering their own online gambling options. Like how real-life gambling first spread to Atlantic City, the state of New Jersey is actively drafting regulations to offer its own answer to online betting. Interstate gaming compacts (like the kinds used for Powerball) could also spread the concept – UltimatePoker is already lobbying California to let residents there get in the game.